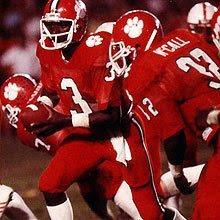 Homer Jordan (#3) was the quarterback and leader of the 1981 Clemson Tigers. They were one of the best college football teams of the 1980s. At the dawn of the decade, a new team emerged to turn in one of the best seasons in college football, capping it off with a win in the Orange Bowl, and capturing the national championship. Every step of the way they were led by quarterback Homer Jordan, who had been on his own odyssey all season. That 1981 Clemson Tigers team was one for the ages, especially because it would be another 32 years before the Tigers would make their next appearance in the Orange Bowl. The Tigers played in the Atlantic Coast Conference, which was much different, and smaller than it is today. They swept through the ACC, winning every conference game. They also won every non-conference game, Taking over the number one spot in the country in the 13th week of the season, then cementing the number one position in the polls and a chance at a national championship. Winning the Orange Bowl would almost guarantee that national championship. Standing in their way, awaiting them in Miami on New Year’s Day, was the number-four ranked and Big Eight Champion Nebraska Cornhuskers. Hanging over the Orange Bowl was a lawsuit against Clemson for recruiting violations. To their credit, NBC raised the issue early in their broadcast, but head coach Danny Ford dodged the issue, instead saying he wanted to focus on the game at hand. This would be the first meeting ever between the two teams, and the first game for either team in six weeks. Although Clemson was unbeaten and champions of the ACC, they were the under dogs coming into the game. The Tigers had never finished higher than fourth in the national polls in their history, and were not even in the top 20 to start the season. The fact they had not had much national television exposure led observers to believe they had a weak schedule and their undefeated record was not that impressive. In fact, the announcers kept stressing this point. They even explained the history of Clemson. John Green Clemson gave land for a land-grant agricultural college in South Carolina, not too far from Athens, Georgia, the town Homer Jordan called home. Moreover, no ACC team had won a national championship since Maryland in 1953. However, Clemson was the only team in the top 10 to defeat two other teams in the top 10, namely Georgia, who was ranked second, and North Carolina, who won the Gator Bowl. Nebraska had started the season 1-2 but reeled off eight straight wins coming into the Orange Bowl, including a victory over defending Orange Bowl champion Oklahoma in their last game. What would make it more interesting was the number two Georgia Bulldogs lost in the Sugar Bowl to Pittsburgh by a score of 24-20 and the number three Alabama Crimson Tide lost 14-12 to the Texas Longhorns in the Cotton Bowl. That meant if Nebraska could beat the number one Clemson Tigers, they could lay claim to the national championship too. Clemson was coached by Danny Ford who, at 33, was the youngest coach in Division 1 in the NCAA and college coach of the year. He had posted a 26-9 record in three years at Clemson. On the other sideline was Tom Osborne, coach of the Cornhuskers for the previous five years. He held a .778 career winning percentage, making him the fifth winningest active coach. In his nine years at Nebraska total, the ‘huskers were 5-3 in bowl games. I just re-watched the game a few days ago, and it was as entertaining as it was the first time, maybe even more because of what some of the players would go on to do. The Tigers were led on offence by quarterback Homer Jordan and All-American receiver Perry Tuttle, a senior from Winston-Salem, North Carolina. Jordan finished the 1981 regular season completing 96 of 174 passes for a 55.2 percent average, 1,496 yards, eight touchdowns, and eight interceptions, to lead the ACC in passing. He was also just 1,500 yards shy of tying Steve Fuller as the all-time leader at Clemson. Ford said that as Jordan plays, so go the Tigers. And they moved the ball, averaging more than 400 yards offence per game that season, and 454 yards per game over their last six games. Defensively the Tigers were led by All-American linebacker Jeff Davis who could bench press 515 pounds. He was the ACC player of the year, just beating out Jordan in balloting for the honour. The defence also had freshman lineman William Perry, who was six feet three inches tall and 305 pounds. Announcer Don Criqui said, “He eats like he’s going to the chair.” The defence held their opponents all season to 251 yards per game total offence. Nebraska’s offence relied on their rushing game. The main ball carriers were Roger Craig and Mike Rozier, while the offensive line was anchored by All-American centre Dave Rimington, who some said was the best player in the nation. He had won the Outland and Lombardi Trophies as the nation’s top lineman, tipping the scales at 285 pounds. He was the second centre and third junior to win the Outland Trophy. He would have his hands full, because lining up across from him was William Perry. Playing quarterback was Mark Mauer, who had come in relief of Turner Gill, a talented player who was dealing with a season-ending injury. If Mauer had to put the ball in the air, he had receivers Todd Brown and Irving Fryar to catch the ball. The Cornhuskers came into the Orange Bowl with the number one defence in the country. They were led by All-American defensive end Jimmy Williams, the fastest player on the ‘huskers. They were bigger, but Clemson was extraordinarily strong, one of the pioneers in weight training. The game was called by Don Criqui and John Brodie. An innovation this year on NBC was having Bob Trumpy in the press box with the coaches from Clemson and Nebraska. Periodically, they would flash to Trumpy and his observations. Nebraska received the ball to start. I recall trying to pronounce the name of Clemson’s kicker, Donald Igwebuike from Nigeria, but was unable to. Again, it was up to Criqui to pronounce it as Clemson kicked off. As the game progressed Criqui and co-host John Brodie, would make more and more of Clemson’s defence, led by that All-American Jeff Davis. It was not long before they made their presence felt, as William Devane knocked the ball loose and recovered the fumble, setting up the Tigers in good field position. Jordan came out and took them into field-goal range, where Igwebuike, whose kicks were extremely high, made it 3-0 with a 41-yard field goal. Nebraska would respond with a little mis-direction. Mauer handed to Rozier who, utilizing the halfback option, threw a 25-yard touchdown pass to Anthony Steels. Kevin Seibel’s conversion gave the ‘huskers the 7-3 lead. The teams hunkered down defensively, as Clemson sent out punter Dale Hatcher, the top punter in the ACC, for his first kick of the game. The Tiger defence then in turn stymied the Nebraska offence. Before the opening quarter ended, Igwebuike hit another field goal, this one from 37 yards out, to make the score 7-6 as the first quarter expired. The Tigers got moving again in the second quarter as Jordan threw a pass in the direction of Frank Magwood. The ball was tipped, but Magwood caught it on the carom for a 44-yard reception deep in Nebraska territory. Then controversy struck. Jordan threw a pass into the end zone. Nebraska defensive back Ric Lindquist dove for the ball. His back obscured the referee’s view, so when he rolled over he had the ball. It was inconclusive, but the official ruled it an interception in the end zone, resulting in a touchback and ending Clemson’s drive. Replays from all angles proved inconclusive as well. It was Nebraska’s turn to move the ball. Rozier took a screen pass and made some good yards. However, Davis asserted his presence, recovering a fumble and ending another Nebraska drive. Clemson turned to the run, first handing to Kevin Mack. The big back had churned out 283 yards in 71 carries for a 3.8-yard average and two touchdowns during the regular season. He rotated with Cliff Austin, who led the Tigers in 1981 with eight touchdowns. He took a hand-off two yards for a touchdown and a 12-7 lead. Coach Ford decided to go for a two-point conversion to make the spread a converted touchdown, but it failed. The teams went into the intermission with Clemson leading 12-7. Jordan had completed five of 12 passes for 62 yards and that disputed interception. Nebraska had two turnovers and Clemson had turned the ball over once. Tuttle had four receptions for 43 yards. Perhaps of greater note: All-American centre Dave Rimington had taken two holding penalties. The Clemson defence was taking its toll. Nebraska had owned the third quarter all season in their games, outscoring their opponents by a combined margin of 111-23. However, Clemson continued to carry the edge in play. Halfway through the third quarter, they had 12 first downs to just five for the Cornhuskers. They put together another drive that looked to stall when Chuck McSwain was dropped for a seven-yard loss on a second-down play. On the very next play, Jordan intentionally under threw a pass in the end zone. Tuttle adjusted to it and hauled in the ball for a 13-yard touchdown reception and an 18-7 lead. Enter Igwebuike for the convert and a 19-7 lead. The drive went 12 plays for 75 yards, using up 4:47 on the clock. Tuttle now had five receptions for 56 yards and a touchdown. It was his 16th career touchdown, and seventh of the season. Nebraska was not out of this game by any means. Criqui and Brodie referred to the previous Orange Bowl where Oklahoma quarterback J.C. Watts rallied his Sooners in the last minute to defeat Florida State. However, it was Clemson who struck again before the close of the third quarter. 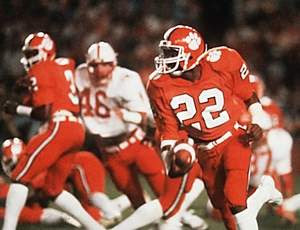 After the Tiger defence stopped Nebraska on their ensuing possession, Clemson punt returner Billy Davis took a kick 48 yards, all the way down to the Nebraska 22-yard line. The drive stalled so Igwebuike came out and booted a 36-yard field goal to up Clemson’s lead to 22-7, with 2:36 left in the quarter. On the first play of Nebraska’s next drive, Clemson defender Johnny Rembert dropped a sure interception that likely could have put the game away. After three quarters, Clemson had 100 yards rushing and 134 yards passing for 234 total yards, with 24:13 in time of possession. Nebraska had 108 yards rushing and 135 yards passing for 243 total yards, with 20:47 in time of possession. Clemson’s success so far, was due in part to the legs of Homer Jordan, who had rushed 12 times for 20 yards. More importantly, he had extended many plays with his scrambling. Just as Nebraska had owned the third quarter all season, they also owned the fourth quarter, outscoring their opponents by a combined margin of 101-20. They had no success in the third quarter, and now had just 15 minutes to make a game of it. They began to give the ball more to Rozier who picked up some key yards in the second half. However, it would be Roger Craig who finally broke through, scoring a 26-yard touchdown with 9:15 to play. The score was 22-13 and Osborne decided to go for two. Craig ran that ball into the end zone as well, cutting Clemson’s lead to 22-15. Craig now had 11 rushes for 88 yards and a touchdown. That drive covered 69 yards in eight plays, and only took 2:50 off the clock. Nebraska would later get the ball back in time to try and tie the game. But, on a critical third down, Clemson tossed Nebraska for a 13-yard loss on a botched pitch. Clemson would get the ball back and, with time ticking, Jordan ran for 23 yards on a key third and long to give Clemson a first down. That run gave him 44 yards on 14 carries. More importantly, the Tigers had a first and 10 with 1:58 left. Nebraska burned their last time out to stop the clock with 1:43 left. After that, Clemson ran all but six seconds off the clock, giving the ball back to the Cornhuskers with a chance at a hail mary pass. It didn’t work. The Tigers knocked down Mauer’s bomb as time ran out. Clemson had won 22-15. A few days later they were voted national champions in the coaches’ and AP polls. It remains their only national championship to date. Two of the best players on that Clemson team, Jordan and Tuttle, ended up playing professionally, but had their greatest success when they came north of the border. Jordan was another of those black quarterbacks caught in the web of prejudice in the NFL back in the 1980s. Considered a good athlete, he was welcome to try out at another skill position, but he just wasn’t quarterback material. That was really funny, considering the Saskatchewan Roughriders thought he was. So did the Winnipeg Blue Bombers. They proved the CFL was colour blind when it came to the quarterback position long before the NFL ever was. Jordan played four seasons in the CFL, from 1983 to 1985 with the Riders and 1986 with the Bombers. but really make his mark in the Canadian Football League with Winnipeg. Tuttle played in the NFL with Buffalo in 1982 and 1983, but found himself in an untenable position. He was essentially deemed a third-down receiver, which brings with it a lot of pressure. His job was to get first downs. That can be difficult when he wasn’t at all in the rhythm of the series or the game. He was released, and looking for work. He caught on with Atlanta and then Tampa Bay in 1984, but was unemployed by season's end. It was Winnipeg who welcomed him with open arms in 1986. In turn, he became one of their best receivers and helped them win two Grey Cups, in 1988 and 1990. He was later inducted into the Winnipeg Blue Bomber hall of fame. Donald Igwebuike would also take a more circuitous path to the CFL. After a successful NFL career with Tampa Bay and one year with Minnesota, he joined the fledgling Baltimore franchise of the CFL in 1994, playing there a season before moving on to the Memphis Mad Dogs, also of the CFL. Todd Brown also found his way to Canada, playing for Montreal. Coincidentally, he would be joined by Nebraska teammate Turner Gill, who sat out that 1982 Orange Bowl with an injury. Brown played for Saskatchewan and Winnipeg as well. It is always fascinating to watch an old football game from beginning to end. It offers a window to another time and another place. We also benefit from the perspective of knowing how everything else turns out. Several great football players, with distinguished service in the NFL, played in the 1982 Orange Bowl. Roger Craig would join the San Francisco 49ers and become the first player in history to have 1,000 rushing and 1,000 yards receiving in the same season. He would win three Super Bowls. Mike Rozier would go on to win the Heisman Trophy two years later, in 1983, then become the first player taken in the 1983 United States Football League draft by the Pittsburgh Maulers. He would eventually find his way to the Houston Oilers and a serviceable career. Dave Rimington, after winning another Outland Trophy in 1982, proved to be as good a centre as experts thought. Joining the Cincinnati Bengals, he would anchor an offensive line for five years before two more with Philadelphia. His impact on college football is felt to this day, as the Dave Rimington Trophy is awarded to college football’s top centre. Irving Fryar would be the first player taken in the 1984 NFL draft by the New England Patriots, and help lead them to the Super Bowl in the 1985 season. He would have a 14-year career that also included stops with the Miami Dolphins, Philadelphia Eagles and Washington Redskins. William Perry would join the Chicago Bears, picking up the nickname “The Refrigerator”, and providing one of the unique characters on the 1985 Bears Super Bowl team. He even scored a touchdown in their route of Fryar’s Patriots. Kevin Mack would join the Cleveland Browns and have several 1,000 yard seasons, helping lead the Browns to the AFC championship game in 1986, 1987 and 1989, losing all three times to the Denver Broncos. Jeff Davis would play six seasons in the NFL with Tampa Bay. The game represented what was wrong with the system of the time. Clemson was unbeaten and ranked number one. They should have played at least the number two team for the national championship. Nebraska, at number four, should have had no chance at the title. Yet, because the champion was decided by a vote, Nebraska could have won the national championship by beating the number one team, since the second and third ranked teams both lost that same New Year’s Day. It is a good reason an actual playoff system, which has finally arrived, was so desperately needed. The game also illustrated how different college conferences were. In 1981, the Atlantic Coast Conference was smaller, with very few nationally recognized powerhouses. That was one of the reasons Clemson did not get the credit or respect it deserved. Since then, it has ballooned in size to include solid football programs such as Miami, Florida State, Syracuse, and Boston College. The same goes for the Big Eight. Back then, there was no Big 12. Instead the South West Conference existed with eight teams from Texas and Arkansas. Eventually it would implode and Texas, Texas Tech, Baylor, and Texas A&M would join the Big Eight to create the Big 12. Since then Nebraska has itself re-located to the Big 10. And Clemson was sanctioned for recruiting violations. Players, such as offensive lineman Lee Nanney, distanced and even disassociated themselves from the Clemson football program and coach Danny Ford. The NCAA came down harshly on Clemson. The Tigers received a two-year postseason ban (1982-83), had the number of scholarships reduced from 30 to 20 for the 1983 and 1984 seasons and were banned from live television for 1983 and 1984. Yet, unlike teams that committed similar violations in subsequent years, they had neither their national championship nor any victories vacated. It also shows how hard it is to win a national championship in college football. Clemson had not won before 1981, and has not won one since. The more I read, the more I wonder if they only won because they were cheating, yet Homer Jordan, Perry Tuttle, and Jeff Davis seemed to be above the controversy and they were the cogs in that championship wheel. Still, watching that 1982 Orange Bowl was entertaining. It’s always fun to watch two evenly matched teams do battle for 60 minutes. In this case, Clemson entered the game undefeated but under appreciated, and showed the entire nation they were for real – and so was their quarterback Homer Jordan. From his neighbourhood in Athens, Georgia to the Orange Bowl in Miami, Florida, Homer’s odyssey was now complete.